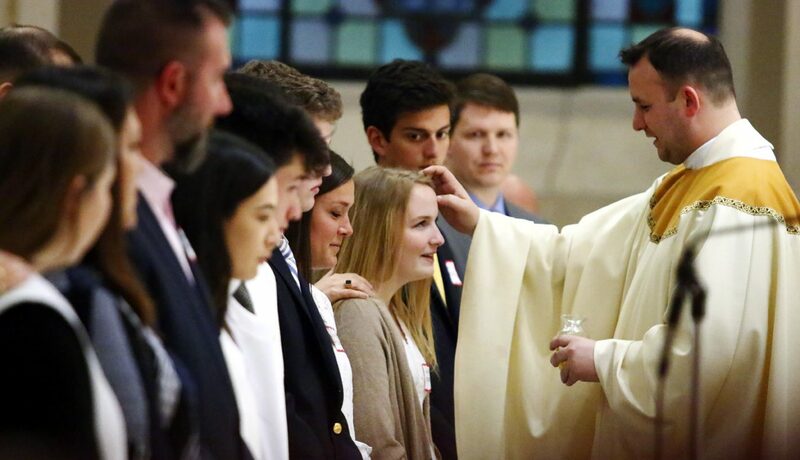 Adults and young adults receiving their Catholic sacraments is a joyous but not unusual event at Easter Vigil Masses around the Archdiocese of Philadelphia. What is unusual is when a number of the candidates or catechumens have not so much a parish as a high school in common. 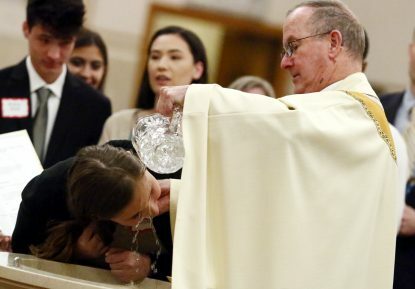 That was the case this year at Sacred Heart Parish in Havertown where the sacraments of baptism, Eucharist and or confirmation were administered by Father Michael Speziale at the invitation of Father Henry McKee, the pastor. Father Speziale is in residence at Sacred Heart but his main ministry is as a faculty member at Archbishop John Carroll High School in Radnor. 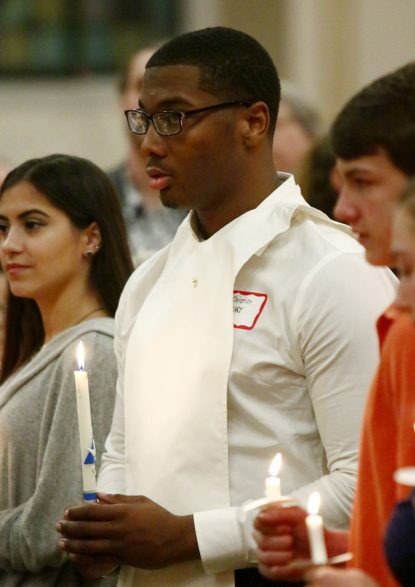 Once the students were identified and instructed, Carroll staff reached out to their parishes of residence for permission to administer the sacraments at Sacred Heart at the Easter Vigil and all agreed, Phillips said. First of all there was Andrew Carpenter, a senior at Carroll who received baptism, confirmation and first holy Communion. Among his family, some are atheists and some of other faiths, and although he attended Carroll he really didn’t have a religion. In his sophomore year Father Speziale, who teaches theology, asked everyone to stand who was Catholic. Andrew was the only one who didn’t stand. When he said he had no religion Father Speziale asked if he would like to become Catholic. “I’m not sure,” Andrew replied, but he was intrigued by the question. As time went on he became more interested, and earlier this school year a Kairos retreat really impressed him. He came to better understand what being a Catholic means. “You know a lot about the Catholic faith, why don’t you become Catholic?” his friend, Sophia Chamberlain, urged. Andrew took RCIA under Father Speziale and at his baptism, Sophia was his sponsor. To make it something of a family affair, Andrew’s sister Isabella, who attends St. Joseph’s University, was also baptized and confirmed. The peer-led Kairos retreats are offered to seniors in four different sessions at Malvern Retreat House and they are very effective, Father Speziale believes. Tyler and Courtney Spencer are twins and seniors at Carroll. Their dad, who died when they were 7, was Catholic but their mother is not religious, Courtney explained. “I was agnostic,” said Tyler, who for most of his schooling was in public schools. He first became interested in Catholicism through Sister Mary Kelly, SSJ, who teaches theology at Carroll. He came to see Catholicism as a beautiful religion that creates harmony on earth. Courtney had a similar experience through theology classes conducted by Christine Rizzo, who also happened to be in charge of RCIA at Carroll. Courtney asked Miss Rizzo what the process would be for them to become Catholic and it was arranged for them to go through RCIA. Again, a Kairos retreat helped seal their decision. 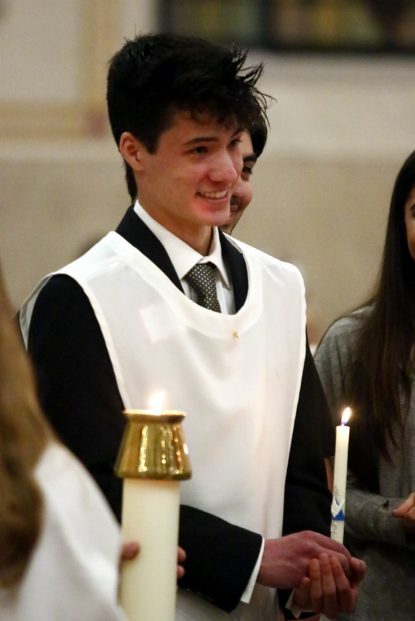 Jake Langley, a sophomore at Carroll who received confirmation at the ceremony, was already a practicing Catholic with a Baptist father and a Catholic mother. He was not previously confirmed because of technicality of location. “We lived in Florida and I was baptized, went to Catholic school and made my first Communion,” Jake said. But in his former Florida diocese confirmation is administered later than in this area, so when the family moved to Pennsylvania he hadn’t been confirmed even though all of his new classmates were. “I told my religion teacher, so now I’ve been confirmed,” he said. The administration of the sacraments was not limited to students. 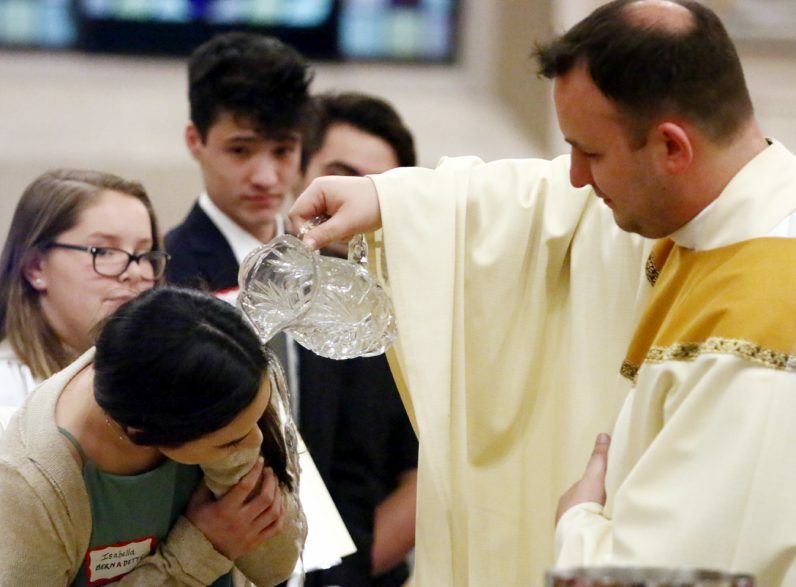 Ashlyn Llerando, a Spanish teacher at Carroll, was baptized Catholic as an infant but attended public school and her family never really practiced religion. Her first real exposure to Catholic practice was as a freshman at Villanova University where she attended Mass with her roommate. But she was into athletics and really didn’t think she had time for an RCIA program. Teaching at Carroll was a new experience for her with classroom prayer. At a faculty retreat she asked the retreat director to pray for her. “She said to me, ‘You are not at Carroll by accident, you should get your sacraments,’” Llerando recalled. The bottom line: at Archbishop John Carroll High School, the “Catholic” in Catholic school is alive and well. Great article! Glad to see some parishes are responding to the need to draw in more people to our faith! It is those who convert who carry much of the spirituality. That was a truly inspiring article. 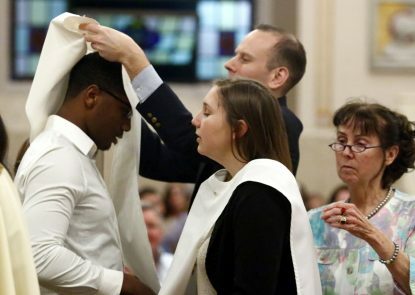 I was upset about this new Evangelization in the Philly.com concerning the program called Anthem which would present the” church and Jesus” in an entirely new way. Augustine, Thomas, and Ignatius did that. Scripture and Sacred Tradition and the Fathers Of The Church did that. We have lost the young because the Catholic Schools and CCD have not done so for years. Our young people because of the religious teaching of the Church by the permission of the Bishops are in crass ignorance. Fortunately for Philadelphia, we have an Orthodox Bishop Archbishop Chaput swimming against the tide of secularism and bad religious teaching. Unfortunately, it is even too much for this good man. Of course, this will not be published.